Editor’s note: This post was originally published on the WHA. blog and re-published here with permission. I thought my college professor, Ronald Rael, was crazy for starting a “make-tank” studio to explore the possibilities of 3D-printed objects using natural materials such as acrylic, nylon, rubber, salt, sand, tea, and wood. But with the emergence of 3D-printed homes made out of concrete and ceramic, I’ve started to realize he was actually quite forward-thinking. 3D-printing is evolving, and its emergence from the small-scale to the large-scale allows for exciting new possibilities in the housing industry. What does it take to build a 3D-printed home? We can simplify it into two crucial but different points: scale of the printer and scale of the project. Scale of the Printer: 3D-printers have grown in size. 3D-printed houses can be built from smaller parts that can be assembled on-site, using the “original, at-home” printers. The benefit–one mistake won’t throw off the entire project. It’s an easy fix, but you must be very organized with your parts if you want the process to go smoothly. The drawback–depending on the scale of the project–parts can take anywhere from hours to days to finish printing. After that, assembly is still needed on-site. But no longer are printers limited to a 12” cube that fits comfortably on your desk. Rather, they have grown to the size of asmall tractor – something capable of printing houses directly on-site in less than a day, saving money on labor and construction. However, like most machines, we must account for error. Every time the printer malfunctions, it must be fixed, and replacement parts can be quite expensive. Scale of the Project: Are we building for one, or one hundred? The possibilities and advancements of 3D-printed homes have made it accessible for someone to print a home of their own, for as low as $4,000. For the homebuilding industry, the possibility of printing homes on an even larger scale, like neighborhoods and master-planned communities, is fascinating. Specifically, these homes may provide a quick solution to places affected by natural disasters, like recent California fires or the earthquakes in Mexico. Of course, costs, permits, and zoning restrictions still must be considered, and each of these factors vary by jurisdiction. In these cases, where people have been displaced from their homes, cities can relax certain building codes to allow for this instant housing solution. We’re already starting to see this happen: in Oakland, restrictions on the ability to build small “cottage” units in backyards have recently been lifted, as a result of the Bay Area’s emergency housing shortage. As a result, Ronald Rael’s “make-tank,” Emerging Objects, created a cabin made from over 4,500 3D-printed ceramic shingles and hexagonal planter tiles produced by a desk-top printer. 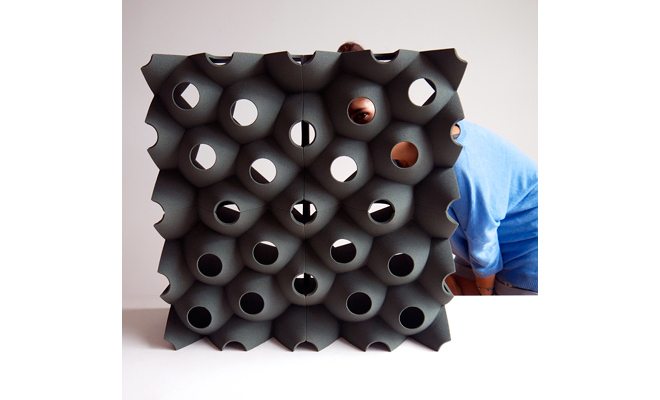 This gives builders and creative studios the chance to experiment with 3D-printed materials at a small-scale to create large-scale solutions. I’ve found a lot of similarities in 3D-printing with Virtual Reality. Both are quickly evolving technologies where exploration is still expanding and growing. In the housing industry, 3D-printed homes aren’t yet the permanent solution to housing emergencies and shortages, but can serve as an intermediate one. But the potential to take this technology to a larger scale, like the creation of master-planned communities in underdeveloped areas, is something yet to be tapped into and exciting to consider. Interested in reading more articles about 3D design, planning and community design? Check out additional posts on WHA’s blog.